Make fresh sauces, purees, jams and more with the Victorio Food Strainer . So easy to use with great results! Place your fruits or vegetables in the large hopper and crank your way to perfectly strained food. One of the best parts? Food do not have to be peeled and the seeds to do not have to be removed! The strainer does that work for you! 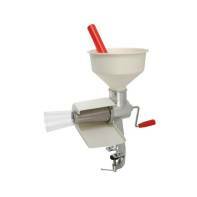 Heat-resistant hopper; stainless steel blades will not rust. Includes mounting clamp for easy using. See optional motor and accessory kit.